We’re well known among tradespeople and homeowners in the south Bristol area, for the excellent product range, friendly welcome and detailed product knowledge offered by our team, and for the well-stocked biscuit tin that our customers are welcome to dip into! Once regulars tear themselves away from snacking, they find a comprehensive range of trade and designer paints, a good selection of wallpaper and a Wallpaper Direct terminal. If we don’t have what’s needed in stock, it can easily be ordered online and you can Click + Collect from store. We also offer site visits for tradespeople looking for expert product insight into their specific decorating and refurbishment challenges, and we also deliver locally. Bedminster Bristol Brewers Decorator Centre is easily found, right next door to The Brunel pub on St John’s Lane, Bedminster. 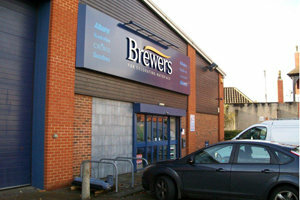 It’s a large showroom, with masses of customer parking and full disabled access. Head south-west on St John's Lane, the store is located on the left. Head east on St John's Lane and follow this road until reaching the store on the right.